"...enjoyable and thought-provoking. Most literature in the area of risk management is designed to be technically rich and fulfills the needs of professionals and organizations. This book, on the other hand, is written for anyone who wants to be more aware of the reasons behind their success and failures regardless of their background. The advice is simple, realistic, and easy to apply. This book is a must read." Project success rates haven't changed in 20 years. Learn why, and what you can do to improve them in your organization! 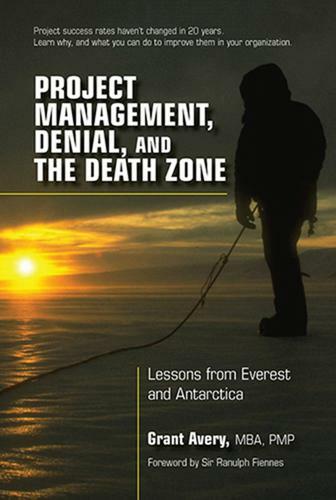 Using examples and lessons learned from the failures and achievements of Antarctic explorers Robert Scott and Ernest Shackleton, and Mount Everest expedition leader John Hunt and others, this captivating guide provides powerful insights into the causes of project and program failure and how to manage them to significantly improve project success rates. Grant Avery, PMP, is a leading expert and international speaker on the subject of risk, quality assurance, business cases, and capability maturity models in project and program management. Mr. Avery has reviewed or overseen the quality, risk and success assurance of over $20 billion of high-risk projects and programs in New Zealand and Australian public and private sectors, including over 100 ICT-enabled business change projects. He is a Certified Project Management Professional (PMP) and a Certified Registered Consultant in Project and Program Management and P3M3 capability maturity assessments, with an MBA of Distinction from Victoria University, New Zealand. Earlier in his career, Grant developed a unique perspective on the successful management of project and program risk in part from the knowledge and experience gained as Manager of New Zealands Scott Base where he was responsible for science support, search and rescue in Antarctica, and a team lead for the joint (USA-NZ) Antarctica search and rescue team (JASART). Prior to developing his own business, Grant was KPMG Director (Project Advisory), New Zealand. Mr. Avery is now President of Outcome Insights, a specialized consultancy that provides success and quality assurance advice and reviews for large and high-risk projects and programs delivering ICT-enabled business change, and initiatives introducing new organizational capabilities. Mr. Avery, co-author of the current edition of the P3M3 maturity model, provides specialist assessment and capability improvement advice on the project, program, and portfolio management practices in organizations. He is an active member of PMI International and the New Zealand Risk Society. His organizations website is www.outcomeinsights.com.